The Sheldon Jackson Museum’s January Artifact of the Month is a Yup’ik model dance scene within a community house or qasgiq (SJ-II-H-46). It is not known who collected this model, nor who made it, but it has been identified as likely being from the Lower Yukon River area. Upon closer examination, this beautifully carved model conveys to the viewer a story about Yup’ik architecture, dancing, and even pilot bread. The date of the January Artifact of the Month model is unknown, but the inscription on the bottom, “Pilot Bread,” suggests it was created sometime in the late nineteenth century. Pilot Bread was invented by a baker named John Pearson of Newburyport, Massachusetts. With a long lasting shelf life and ability to withstand voyages over sea, the cracker was similar to hard tack with the added benefit of being far more palatable due to its higher sugar and shortening content. Starting in the mid-1800s, pilot bread, brought north on ships and for crews’ consumption, was an important trade item. Once the bread was eaten, the wooden crates used to transport the crackers were frequently recycled into objects like this model and then sold or traded. Housing among the Central Yupiit of Southwest Alaska was divided largely along gender lines. The qasgiq was a community ceremonial building at different times of the year and a place where men and older boys resided nearly all year. Women, girls, and younger boys lived in smaller family houses called ena, “sod houses” or sometimes, “women’s houses.” In addition to providing housing, the community house served as an essential site for celebrations, festivals, and dances such as the one shown taking place in this model. The model is a detailed portrayal of the inside of a typical Yup’ik qasgiq along the Lower Yukon River in the 19th century. Large benches flank all sides of the interior space. There are two black saucer-like shaped lamps on tapered posts on the left and right side with small wooden pieces sticking out of them, representing a fire’s flame, vital for heat and light in the room. The room is warm – the men sitting on the benches surrounding the central part of the house are all naked except for one wearing pants on the left side. The hole in the floorboards in the center is the site of a hearth. Four drummers, complete with their drums and drum sticks, sit at the back, their arms raised. A fully clothed woman and four men around the hearth dance and are positioned in what Anne Feinup-Riordan describes as a “ritually correct configuration” of four corners and a center. Eyes focused on the center of the room, and clearly in a state of movement and song, all of the figures’ mouths are open. In her book, The Living Tradition of Yup’ik Masks, Fienup-Riordan states both men and women participated in the northern-style pualla dance, the dance shown in this model. A single woman stood in the middle of four men who stood with their feet spread apart and moved their arms about their upper body, an action for which the dance is named (see footnote). According to Justina Mike’s interview with Fienup-Riordan, pualla dancing involved singing special pualla songs. While the singing took place, a man wearing pants entered the qasgiq with a wooden bucket in his hands. He put the bucket down in the center of the room and the people stopped dancing. A person from the side then approached the man and start talking, saying that half of his bucket contained ice and the other half, land. Each time a new visitor to the qasgiq arrived, the pualla song would be repeated. 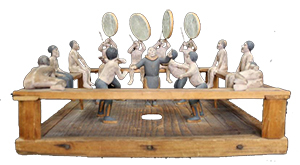 During the dance, two to six men would drum on shallow, tambourine-like drums made with rims of bent spruce and walrus stomach. The Sheldon Jackson Museum’s January Artifact of the Month will be on exhibit until January 31st. This museum is home to six model qasgiqs with figures inside dancing, singing, and in a state of ceremonial prayer. Such models were typically made for the artist’s pleasure or made to be sold in the souvenir trade. Though not made to scale, they accurately depict the kinds of activities that would take place in a community house. Visitors can see the Artifact of the Month, the museum’s models, and many other Yup’ik artifacts Tuesday through Saturday between 10am and noon and 1pm and 4pm. General admission is $5, $4 for seniors, and free for those 18 and under or members of either the Friends of the Sheldon Jackson Museum or Friends of the Alaska State Museum. Only men stood in this manner and moved their arms about in the pualla whereas women engaged in other movements and dances and exclusively performed dances called yurapiat and ingula. The most commonly performed dances today are the arula. Each has its own song made of three parts.